Pigmented lesion treatment provides the most benefit to those with superficial benign pigmented lesions. To achieve optimal benefit 1to2 treatments may be necessary about 3 weeks apart. 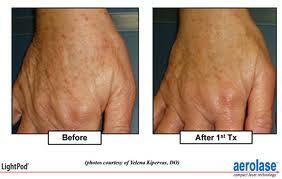 Pigmented lesion treatment with the Apogee Elite laser has minimal post treatment care. Clients may return to normal activities after treatment. Suspicious pigmented lesions should NOT be treated.